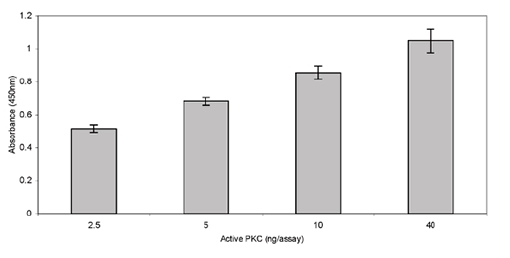 The PKC Kinase activity kit is an efficient assay that utilizes little sample volume. This kit gives you the ability to an end-point or kinetic assay read-out in a convenient 96-well plate based assay and offers easy sample handling protocols. The assay also offers a high signal to background ratio. Application Notes: For the measurement of PKC kinase activity partially purified, purified, or crude enzyme preparations from any species. Cited sample type includes tissue (ref. 1). Use/Stability: Store all components at +4°, except active kinase at -80°. 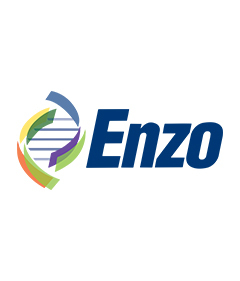 Scientific Background: Protein Kinase C (PKC) is a large superfamily of serine/threonine kinases that mediate essential cellular signals required for activation, proliferation, differentiation and survival. There are at least ten PKC isotypes that are closely related in structure but that have distinct patterns of tissue distribution and function. The PKC isotypes can be subdivided into three classes based on primary structure and biochemical properties. These are: classical or conventional PKC isotypes (cPKC), novel PKC isotypes (nPKC) and atypical PKC isotypes (aPKC).